Amid the tidal wave of backlash against McKesson Corp. for its role in the opioid crisis and allegedly repackaging cancer drugs, the drug distributor encountered yet another battle Monday: a letter urging its shareholders to vote against the reelection of its audit committee chair. The International Brotherhood of Teamsters—whose pension and benefit funds have more than $100 billion invested in capital markets, including $30 million in San Francisco-based McKesson—blames Marie Knowles in its letter for what it describes as the company's failed opioid oversight following its $150 million settlement with the Drug Enforcement Administration for alleged violations that took place between 2008 and 2013. The letter references the recent False Claims Act lawsuit against McKesson by Omni Healthcare for allegedly repackaging cancer drugs from single-use vials into non-sterile syringes and selling them to cancer centers, medical practices and physicians. AmerisourceBergen had to pay about $900 million in fines last year after a lawsuit accused that drug distributor of similar practices. "Since Knowles joined the audit committee in 2003, McKesson has incurred more than a billion dollars in legal costs due to an array of legal and regulatory compliance failures," Ken Hall, Teamsters' general secretary-treasurer, wrote in the letter. "Even without the opioid issue, this unenviable record ought to warrant refreshed leadership of the audit committee." Knowles has served as audit committee chair since 2004, and is the only incumbent audit committee member to have served during the "critical period" of 2008 to 2013, according to the letter. 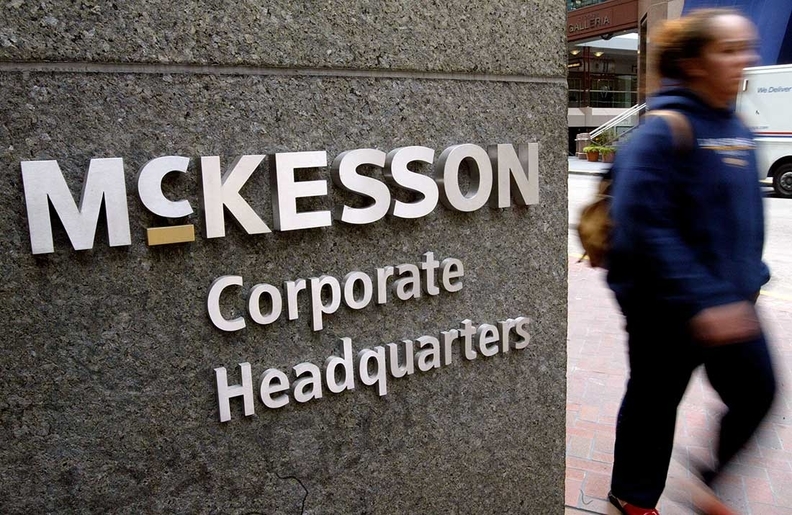 Under its settlement with the DEA, McKesson pledged to revamp its corporate-wide monitoring program intended to flag suspicious orders and block the shipment of controlled substances to pharmacies once certain thresholds are met. But the Teamsters' Hall wrote that the company failed to review the program's functioning for four years. Teamsters analyst Michael Pryce-Jones told Modern Healthcare on Monday that his organization had not yet received a response on that allegation from McKesson. April Marks, a spokeswoman for McKesson, wrote in an email that the company is optimistic all of its directors will be re-elected. "Marie Knowles is an highly experienced and valued member of our board of directors," Marks wrote. "Since our last shareholder meeting, the company has maintained a robust dialogue with our shareholders and has taken action based on the feedback." The Teamsters requested in October 2016 that McKesson review oversight of the program by its senior management and board. The company released the results of the review in April, concluding that its senior management and board "acted in good faith" to meet its obligations under the DEA settlement. In his letter, Hall wrote that the review was not a robust examination and left out critical points, such as an examination of the company's opioid sales. "This suggests to us that the report was prepared with more of an eye towards defending against legal suits than a thorough evaluation of the performance, competency and accountability of specific individuals," he wrote. McKesson's annual shareholder meeting is scheduled to take place on July 25. This isn't the first time the Teamsters have worked to spur change at McKesson related to its role in the opioid crisis. The organization led a successful campaign last year against the company's executive pay plan. After that, McKesson cut its CEO's pay by about 10%, the Teamsters wrote. John Hammergren received a pay package of about $18 million during the last fiscal year. Another McKesson shareholder, the UAW Retiree Medical Benefits Trust, sent a separate letter to shareholders Monday urging them to vote in favor of three resolutions at the July 25 meeting. The first would require the company to disclose lobbying activities and expenditures. The second would make changes to the company's policy on accelerated vesting of equity awards. The final resolution would remove the exclusion of litigation and other costs from the metric the company uses to determine senior executive cash incentives. "Particularly at a time when McKesson is facing legal claims and settlements, the exclusion of litigation from metrics that drive executive pay severs pay from performance," wrote Meredith Miller, chief corporate governance officer with the UAW Retiree Medical Benefits Trust, along with four co-signers. "Incentive pay should incentivize executives to consider legal risks rather than removing them from the calculation." All three resolutions, UAW wrote, come from the Investors for Opioid Accountability, a coalition of state treasurers, comptrollers, asset managers and labor funds.